In this lesson, we will learn how to find the geometric sequence that satisfies given conditions. Find the geometric sequence where 𝑇 = 5 0 0 1 and 𝑇 = 1 2 5 3 . Find the first three terms of a geometric sequence given 𝑇 = − 3 6 1 6 6 and the common ratio is − 2 . The first term of a geometric sequence is 2, and its third term is 7. If the common ratio is negative, what is the second term? Find the value of 𝑎 2 in a geometric sequence given 6 𝑎 + 𝑎 = 1 6 𝑎 , 𝑎 = 6 2 2 3 1 1 0 and all terms are positive. Find the geometric sequence given 𝑇 + 𝑇 = − 5 0 2 4 and 𝑇 + 𝑇 = 1 2 5 2 1 2 2 . Find the geometric sequence given the sum of its first five terms is 154, 𝑇 = 2 𝑇 + 1 5 𝑇 4 3 2 and all terms are positive. Find the geometric sequence given three times the sum of its first and third terms equals the sum of its second and fourth terms, and its fifth term is greater than twice the sum of the first four terms by 10. Find the geometric sequence given 𝑇 − 𝑇 = 5 8 3 2 5 4 , 𝑇 − 𝑇 = 2 5 9 2 4 2 , and all terms are positive. Find the three consecutive numbers of a geometric sequence, given that the sum of the terms is − 1 4 and the product is 216. Find the geometric sequence in which 𝑇 − 𝑇 = 1 3 8 2 4 and 𝑇 − 𝑇 = − 6 9 3 1 . Recall that 𝑇 𝑛 is the 𝑛 t h term of a sequence. For the given sequence, what is the missing term? Find the geometric sequence in which 𝑇 + 𝑇 = − 1 8 2 5 and 𝑇 + 𝑇 = − 9 3 6 . Find the geometric sequence given the sum of the first and second terms is 192, and the sum of the sixth and seventh terms is 6. Then find the order of the term whose value is 4. 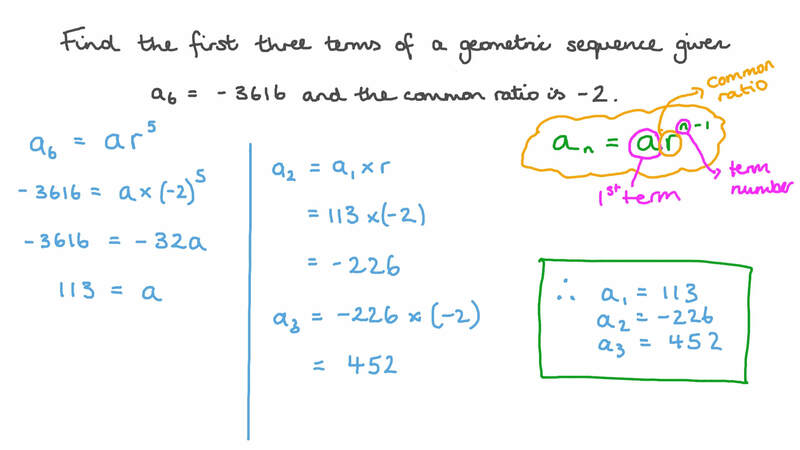 Find the increasing geometric sequence given the third term exceeds the sum of the first two terms by 50, and the sum of the first and third terms exceeds the second by 70. Find the geometric sequence given 𝑇 + 𝑇 + 𝑇 + 𝑇 = 8 5 1 2 3 4 , 𝑇 − 𝑇 = 5 1 0 6 2 , and all terms are positive. Find the geometric sequence given that − 𝑇 + 𝑇 = 6 𝑇 3 4 2 , 𝑇 = 7 8 8 and all terms are positive. Find the geometric sequence given the sum of the first three terms is 112 and 𝑇 + 𝑇 + 𝑇 = 1 4 4 5 6 . Find the geometric sequence in which 𝑇 + 𝑇 = 6 2 3 and 𝑇 × 𝑇 = − 7 1 4 . Find the three consecutive numbers of a geometric sequence, given their sum is 7 and the product of their squares is 64. Find the geometric sequence 𝑇 𝑛 , given 7 𝑇 = 5 6 𝑇 5 2 and 𝑇 − 𝑇 = 1 5 6 3 4 . 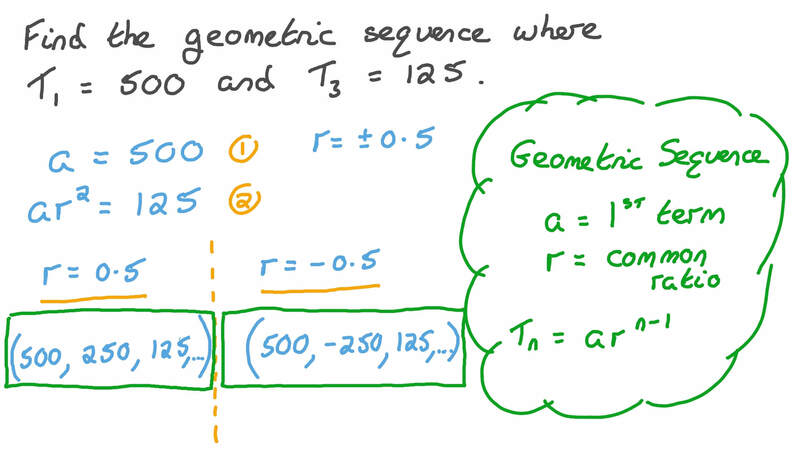 Find a geometric sequence given the second term is − 6 and the sum of the first and third terms is 15. Find the geometric sequence given the sum of the second and third terms is 9 and the product of the first and fourth terms is − 3 6 . Find the first three terms of the geometric sequence given their sum is − 7 and the sum of their squares is 21. Find the geometric sequence given 𝑇 = 𝑇 − 1 3 2 , 𝑇 + 𝑇 = 5 2 2 2 3 and the first term is positive. Find the geometric sequence given 𝑎 = − 2 5 1 and 𝑎 = − 8 0 0 6 .